Arepas con queso from street vendors are the best! 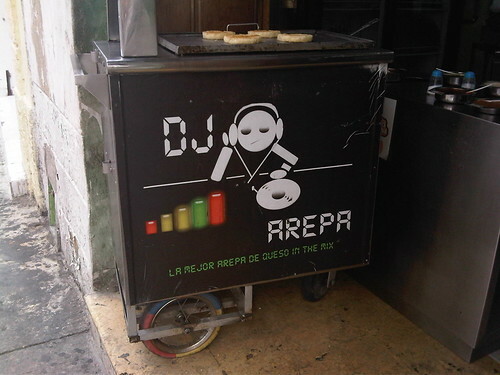 Arepas are a staple of the Colombian diet, and their ubiquity ensures most visitors to the country will try them either from street vendors, small shops, or as part of larger restaurant meals. 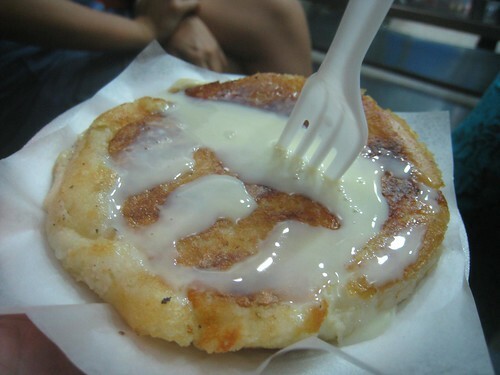 Arepa con queso (with cheese, topped with sweetened condensed milk) in Medellin. An arepa with cheese from a street vendor is the one Colombian comfort food I missed the most while living back in the USA. Usually priced at 1,500 Colombian Pesos, or about $0.80, they are heavy enough to fill me up for an entire lunch or dinner. Inside the street arepas is a gooey, melted cheese that adds a richness plain arepas often served alongside lunches in restaurants are severely lacking. 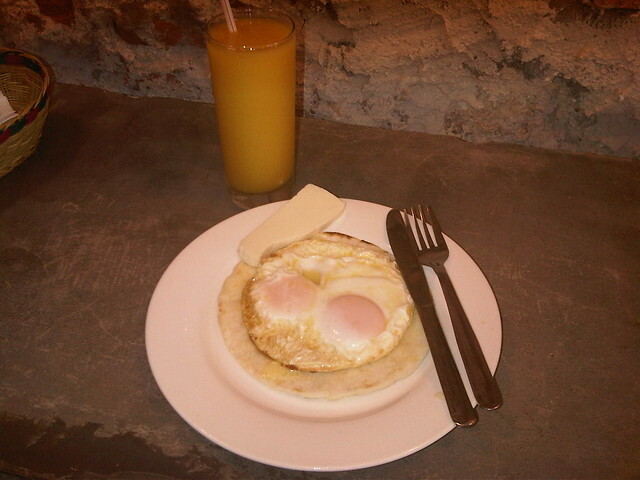 Arepa con huevos y queso (eggs and cheese), with fresh mango juice. While in Cartagena, I frequented a small juice and arepa shop called El Jugo on La Calle de Media Luna in the Getsemani neighborhood (where you find all the hostels). Open only a few months, they offered 3 common arepa options. 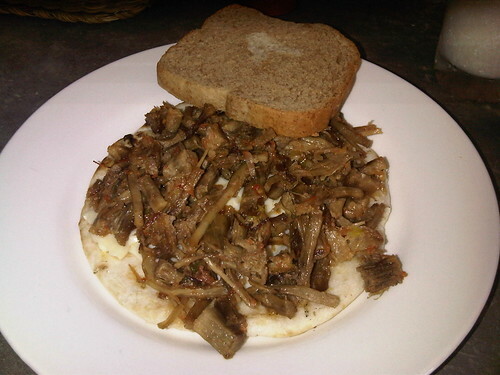 Arepas served with fried eggs (and optionally, cheese) are a popular breakfast option. Add salt at a minimum, or a little salsa if you want to spice it up. It may look bland, however my favorite combo is Arepa con pollo y queso (chicken and cheese). The arepas with chicken at El Jugo were divine. It was the first time I'd tried this combination, and it made for a satisfying lunch. Though the color may make it look a little bland, there was plenty of flavor from the salsa added to the chicken. And, of course, there was melted cheese with every bite. Arepa con carne y queso (meat and cheese). An aprea with meat was my least favorite, though to be clear, I'm much more of a chicken fanatic. Also flavorful, and bedded on melted cheese, it left me satisfied for an afternoon as well. 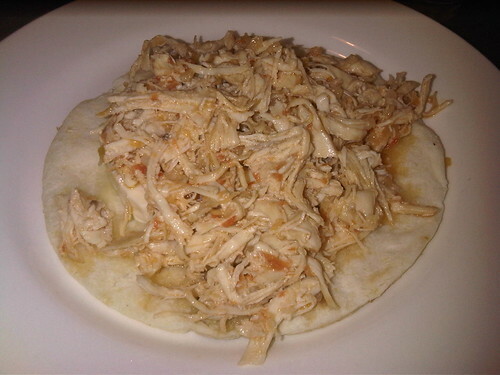 In Colombian homes, arepas can be cooked any number of ways. Last year, while I was living with Martin from Germany, he would allow chocolate to melt atop his arepas as he cooked them on the stove. Our Colombian roommate, Maira, would slice up a hot dog or chorizo and add them to hers. Arepas are akin to a blank canvas, much like crepes in France. Their deliciousness is only limited by one's imagination. Are there dessert ones as well? The cheese and the eggs looked yuuuuuuumy! The dessert ones are with melted chocolate on top, however it's not featured on the restaurant menus as often as the others. I see quite a few sites that look interesting and really worth a read. There’s nothing worse than searching through endless yada yada blogs just to locate a few that keep ones interest. Many thanks. Great work! Great information and facts, many thanks to the article author. The idea is perplexing to me right now, however all around, the usefulness and significance is overpowering. Very much thanks once again and also all the best . !